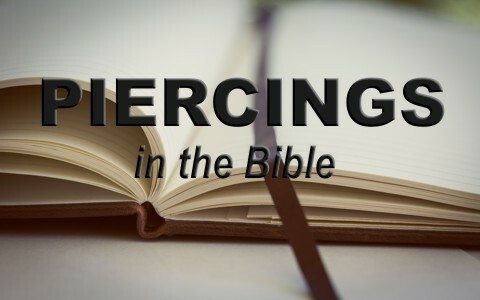 Does the Bible say anything about body piercing? If so, do these verses apply to us today? When a person puts their trust in Christ, after having been brought to repentance by God, they are commanded to come out of the present, evil world. We understand that we have to live in this world, but that doesn’t mean we’re to be part of the world. In several places in the Bible, we are told to “Come out of her, my people, lest you take part in her sins, lest you share in her plagues” (Rev 18:4), and notice this command is for “my people,” meaning the people of God. The Apostle Paul repeats a command that is found throughout the Old Testament too, as he wrote, “Therefore go out from their midst, and be separate from them, says the Lord, and touch no unclean thing; then I will welcome you, and I will be a father to you, and you shall be sons and daughters to me, says the Lord Almighty” (2nd Cor 6:17-18). Jeremiah tried to warn the nation of Judah by telling them, “Go out of the midst of her, my people! Let every one save his life from the fierce anger of the LORD” (Jer 51:45), but they didn’t listen and were taken into captivity. The point of all of these Bible verses is that we must come out of the evil world, not living like the world, because God has called us to be separate from the world and not partake of her sins and plagues. We cannot attain holiness on our own. Our righteousness must come from God. In showing how this is possible, Paul writes “For our sake he made him to be sin who knew no sin, so that in him we might become the righteousness of God” (2nd Cor 5:21), so since we’ve been declared righteous before God because of Christ, we ought to be living like it. The Apostle Peter wrote, “As obedient children, do not be conformed to the passions of your former ignorance, but as he who called you is holy, you also be holy in all your conduct, since it is written, “You shall be holy, for I am holy” (1st Pet 1:14-16). Peter’s reasoning is “if you call on him as Father who judges impartially according to each one’s deeds, conduct yourselves with fear throughout the time of your exile, knowing that you were ransomed from the futile ways inherited from your forefathers, not with perishable things such as silver or gold, but with the precious blood of Christ, like that of a lamb without blemish or spot” (1st Pet 1:17-19). Did Jesus pay such a high price only to have us live like the world? By no means! The Old Testament commanded the very same thing for ancient Israel as God told Moses to “Speak to all the congregation of the people of Israel and say to them, You shall be holy, for I the LORD your God am holy” (Lev 19:2). We have to live in the world but we are not supposed to live like the world. That’s perfectly clear throughout Scriptures, and particularly where the Apostle Paul tells us, “let us cleanse ourselves from every defilement of body and spirit, bringing holiness to completion in the fear of God” (2nd Cor 7:1). Even further, Jesus says to us, “You therefore must be perfect, as your heavenly Father is perfect” (Matt 5:48). How can a person be perfect? We can have Jesus’ righteousness imputed toward us and since we have Jesus’ righteousness, we must live like it. Jesus adds, “If you were of the world, the world would love you as its own; but because you are not of the world, but I chose you out of the world, therefore the world hates you” (John 15:19), but if the world loves you, and you love the world, the Father is not in you, so says John in 1st John 2:15 where he writes “Do not love the world or the things in the world. If anyone loves the world, the love of the Father is not in him.” James rebukes the church by writing, “You adulterous people! Do you not know that friendship with the world is enmity with God? Therefore whoever wishes to be a friend of the world makes himself an enemy of God” (James 4:4). Jesus tells us to follow Him and not the ways of the world (John 21:22), but this isn’t something new. God called ancient Israel to come out of the world’s system of evil and not follow after the pagans. In writing to Israel, He says “You shall not make any cuts on your body for the dead or tattoo yourselves: I am the Lord” (Lev 19:28). Some of the ancient, pagan nations were having body piercing of all kinds, so God was trying to have Israel be set apart for His holy use and not be like the pagans, so God says through Moses, “You are the sons of the Lord your God. You shall not cut yourselves or make any baldness on your foreheads for the dead” (Deut 14:1). Rather than having embroidered gold clothing, fancy apparel, and jewelry, Paul writes that “women should adorn themselves in respectable apparel, with modesty and self-control, not with braided hair and gold or pearls or costly attire” (1st Tim 2:9). Although these Old Testament commands forbidding body piercing were written to Israel, why would we want to live like the world by looking like the world? Most people do body piercing because everyone else is doing it, but we’re to follow Christ, not the world. Dressing nicely is not wrong…but dressing like, looking like, talking like, and acting like the world shows we love the world, and if we love the world, then as we have already read, the love of the Father is not in us (1st John 2:15). The Apostle Paul wrote “do you not know that your body is a temple of the Holy Spirit within you, whom you have from God? You are not your own, for you were bought with a price. So glorify God in your body” (1st Cor 10:31), and although he was writing about sexual immorality, we can see the same principle applies today. We must use our bodies to glorify God and not follow after the fashions and trends of the world. We’re supposed to come out of this world and not be part of the world, because our home is not in this world. Related reading for you: Should Christians Get Tattoos?